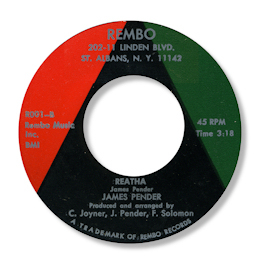 The two 45s that James Pender released on Rembo have a St Albans, NY address on them so it’s a fair bet that he was living there. Reatha is far and away the pick side from his first effort, not just for the fine bluesy guitar picking, but also for Pender’s passionate wailing and the strong background vocals too. The horns, which are very slightly out of tune, add to the charm of the piece. Both sides of his second single have a tricky little rhythm to them, not really funky enough for the dancers, but great for tapping your toe to. And “Fifty Fifty Romance” may just be the better side due to a better melody. UPDATE ~ My great friends Greg Burgess and Michel write with some excellent info regarding James' earlier recordings. James Pender is likely to be the same singer who performed in the late 60's for the popular R&B vocal group The Wheels . They had a big hit in 1956 'My Hearts Desire' Premium Records (Linden, New Jersey) fronted by the late Rudy Anderson. Pender was also a member of the Federals and the Empires. I'm grateful to Greg and Michel as always. UPDATE ~ There is a very obscure third Rembo release now in the discography. I'm grateful to Mr Finewine, Bob Abrahamian and my friend Matt Futerman for tipping me off about this one.